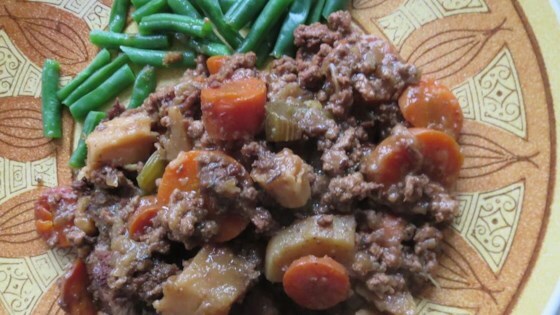 "This beef stew always has people asking for the recipe. It is thick and heavy on the onion, as that is what my family likes. As I am lazy, I do not brown the beef before sticking in the slow cooker." Mix ground beef, carrots, onions, parsnip, sweet potato, water, brown gravy mix. onion gravy mix, beef bouillon, salt, pepper, oregano, basil, and thyme in a slow cooker. Turned out rather salty. I didn’t mind but the parents weren’t thrilled. Everything was cooked perfectly. Good base recipe, but I think next time I'll use roast instead of ground beef, and forgo the thyme. There was a flavor I didn't care for, and I think that was it. Surprisingly good. I didn't have parsnips. it turned out OK anyway.